Bruce Blackburn is an agent with Military Intelligence. Holding the rank of Captain in the U.S. Army, he has been an agent with that organization for some time, though how long is not mentioned. In fact, not very much at all is mentioned about Blackburn. We know by observation that he is still fairly young. He is certainly athletic. He is also quite good looking with black hair and a strong rugged face. Other than that, not much else is available. Except, of course, that he dies in the first recorded adventure. His death is faked, of course. So is that of his friend and fellow officer, a lieutenant known as Jackson (what Jackson's first name is we never learn). The two men serve together in G-2 and are of similar age and height and build. This is important to the storyline because as the first case we know about is beginning, someone has leaked a picture of Blackburn to the media and a newspaper splashed it on the front page. Since Blackburn was working mostly undercover, that was a very bad thing to have happen. So, to compensate for his exposure, Blackburn decides he must die. It is not certain whose idea it was, his or their boss, the Colonel, but the fake car accident was reported to have claimed the lives of both Blackburn and Jackson. The two officers then headed to the office of a plastic surgeon who performed his magic and two weeks later, both report back for work looking like identical twins. To continue the illusion that Blackburn was dead, they take over an antique store in New York City and use it as their base of operations. There, Jackson routinely runs the establishment while Blackburn goes about his undercover counter-espionage work. Jackson's role is usually a small one, if any. Trailing people seems to be his forte. Their look-alikeness comes into play on a few occasions when Blackburn is being watched or must be in a secret meeting with bad guys and needs to get away for his own work - in comes mirror-image Jackson. Once or twice Jackson saves the day but it is Blackburn who nabs the bad guys and rescues whatever needs it. Helping out a time or three is Sergeant Gurk, apparently an employee of the antique shop who is also good at following folks or just guarding them. Gurk is there for the first few missions but then disappears (transferred?). Even Jackson plays less and less of a role in the activities though he never disappears for good. A tad over halfway through the adventures, a young beautiful foreign agent arrives in America to cause all sorts of trouble and plays havoc with Blackburn. Known only as Sonya, she is the daughter of a notorious World War One female agent and is carrying on her mother's line of work. For quite a while it is not stated exactly who she works for except it is European and prone to goose-stepping. Towards the end of the series' run, the word Nazi is finally used clarifying the matter. Sonya will prove to be a resilient and very resourceful adversary and extremely good at escaping after being captured. 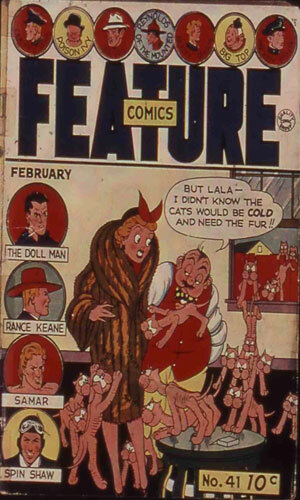 Feature Comics was one of many comic book publications which operated as an anthology presenting a wide assortment of repeating characters, each with his or her own short episode. It was published by Quality Comics. 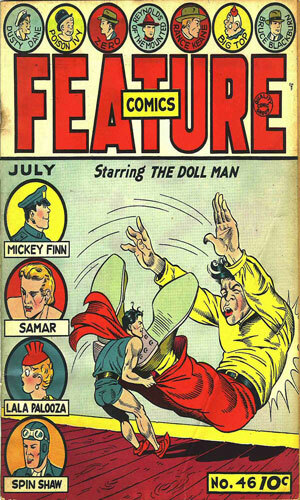 According to Wikipedia, its forerunner was Feature Funnies, put out by Harry Chesler from 1937 to 1939 lasting 20 issues and then renamed, coming out at just Feature Comics with issue #21. 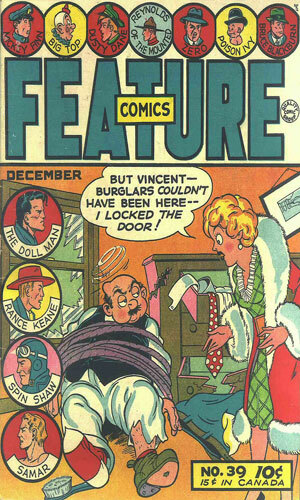 As Feature Funnies the magazine presented a lot of comedy strips and a fair assortment of crime-fighters or adventures. It also gave us Black X for a while. 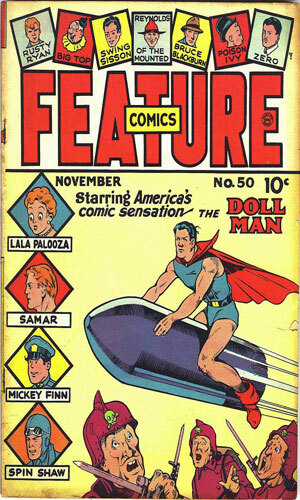 When it turned into Feature Comics it moved into the nascent superhero arena, though not at first. 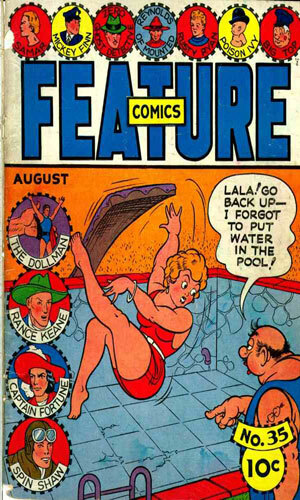 Initially it just continued with the new work by Will Eisner (via his many pennames) and reprints of newspaper comic strips. 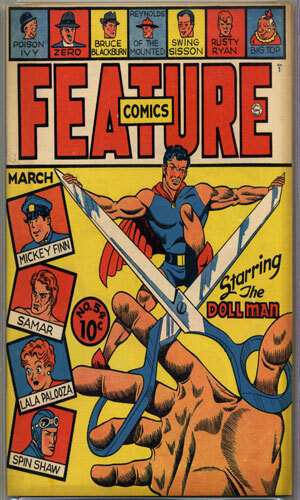 Its superhero, staring with issue #27, would be Doll Man, an Eisner creation who could shrink down to the size of a doll but still pack a heck of a wallop. 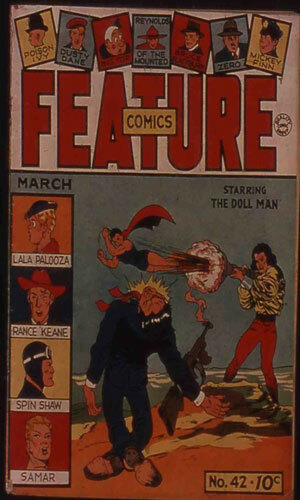 It was in issue #32 in May of 1940 that Bruce Blackburn, Counterspy, made his debut, fighting the enemy agents from often unspecified European countries who want to either disrupt American diplomacy or mess with the U.S. straight out. This ambiguity would last until shortly after the attack on Pearl Harbor and the mutual declarations of war between the U.S. and the Axis powers. 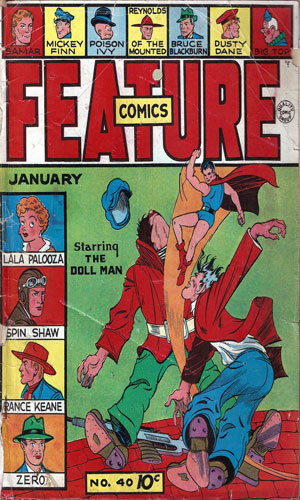 Blackburn stayed in constantly action for 25 issues. 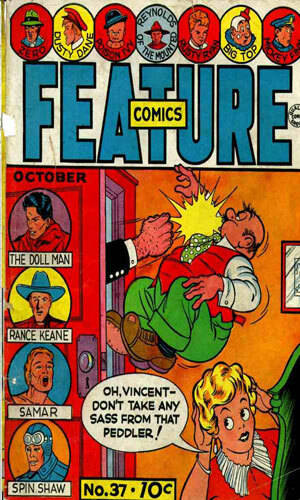 Many comic characters saw their final episode end while promising more action "next month" or "next issue", never to be actually happen. This is not the case with Bruce Blackburn for though his continued exploits are touted at the end of each mission, when his last came, the promo was for a new character, Spider Woman. One interesting tidbit about Bruce Blackburn takes place in the 8th and 9th adventures (Feature Comics #39 and #40) when the intrepid operative put on a costume and hit the streets as the Destroying Devil (although he was also called Destroying Demon by a bad guy and Avenging Devil by the Colonel). Whether this was intended as an interesting one/two-spot story or a planned transition to a crime-fighter role is not known. Whichever the intent, it did not last long and Blackburn was back in his normal suit and tie. From Feature Comics #32 - Bruce Blackburn and Jackson need to catch a spy selling secrets out of the War Department. To do so, they must fake their deaths and get their faces altered to look like twins. 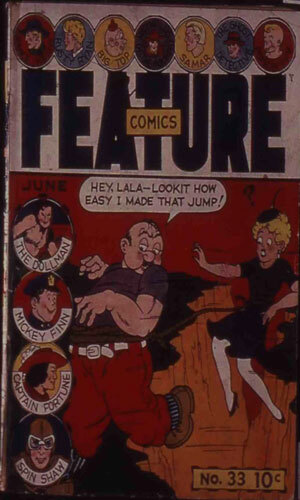 From Feature Comics #33 - Secret messages are left with Lt. Jackson to give to Bruce Blackburn to decrypt but a woman gasses Jackson and snatches him and the coded texts. Feature Comics #34 - The conversation from a secret conference have been leaked and Bruce Blackburn's task to find out who leaked them. 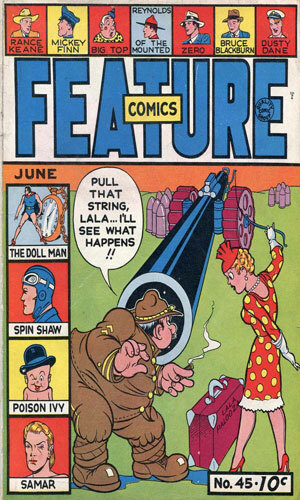 Feature Comics #35 - The King and Queen of Slovonia are coming to America for a state visit but enemy agents plan to kill them to destroy relations with the U.S. 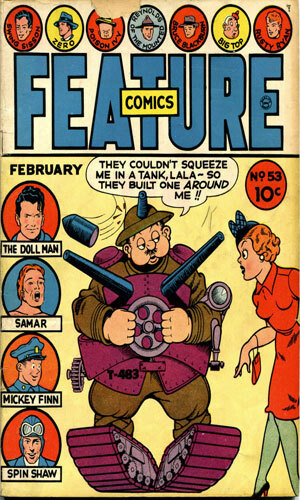 Feature Comics #36 - Even as an inventor is telling Military Intelligence his revolutionary new motor is ready for testing, enemy spies are tracking him down to steal it unless Bruce Blackburn and Jackson can stop him. 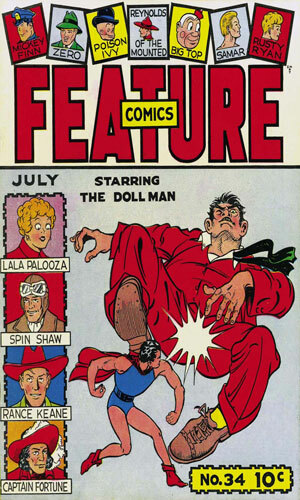 Feature Comics #37 - A nightclub tap dancer has hypnotized Military Intelligence's Chief of Research and extracted vital secrets from him to be passed along to fellow agents. Feature Comics #38 - A group of foreign agents want to get hold of a new bomber but since it is well guarded, they plan to use 'Kadavergas' to get rid of the protection. 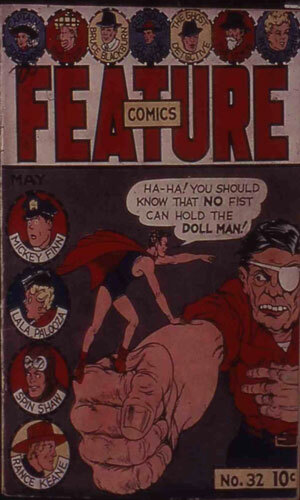 Feature Comics #39 - To destroy a group called the 'Un-American Band' Bruce Blackburn borrows an idea from a kid and assumes the role of a masked crime-fighter, 'The Destroying Devil'. Feature Comics #40 - Enemy agents are smuggling supposedly 1000 refugee children to stay at an orphanage near New York but they are really troops planning an attack. Bruce Blackburn is on to them. 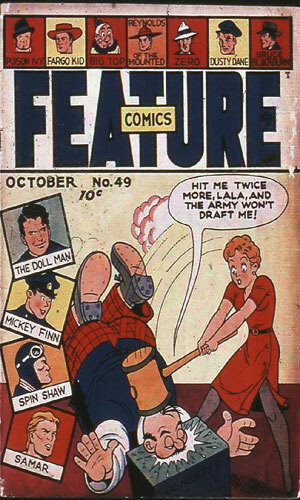 Feature Comics #41 - The Anti-American Band that Bruce Blackburn infiltrated is killing large numbers of draftees to weaken recruitment and the army. Feature Comics #42 - The plan of Prussorian agents is to destroy relations between the U.S. and Angolia (sic) but Bruce Blackburn is onto it. 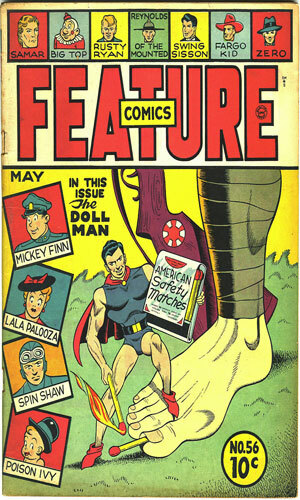 Feature Comics #43 - The plot is to blow up the Panama Canal using American explosives. While undercover Bruce Blackburn learns of it and wants to stop it but the head of the spies, Gross, insists on sticking by his side. Feature Comics #44 - Yet another leak from Military Intelligence, this time in the Drafting Room and Bruce Blackburn is ordered to plug it. The wife of a draftsman is the 'spy' but she only did it because she war scared into it. 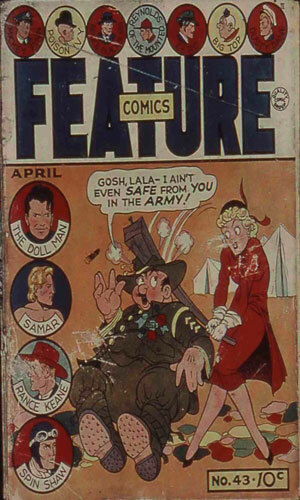 Feature Comics #45 - Thefts of manganese at the Farnum Sheet Metal Company have crippled production causing trouble for the Army. Bruce Blackburn is sent in to find the cause and fix it. 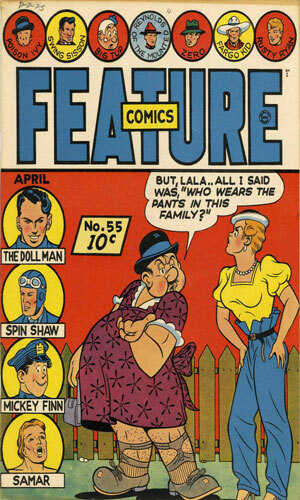 Feature Comics #46 - Fraulein Doktor was, apparently, a WWI spy. A woman known as Sonya is involved in the killings of numerous American agents and she may well be the daughter of that infamous operative. 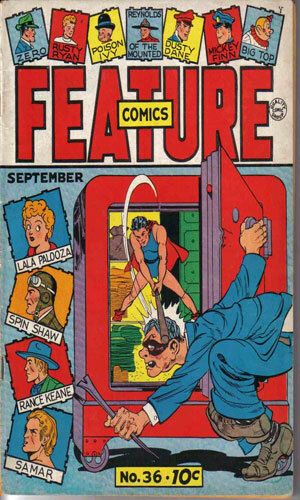 Feature Comics #47 - The latest leak of classified information is coming from the Code Room and when Bruce Blackburn investigates, he finds a dead man clutching a typewriter ribbon. Nasty agent Sonya is back in action. Feature Comics #48 - Yet another leak of information, this time details of secret sessions of the Military Affairs Committee, must be stopped. Bruce Blackburn knows it is being done by radio intercepts but now he must find a way to stop it. Sonya is still around. 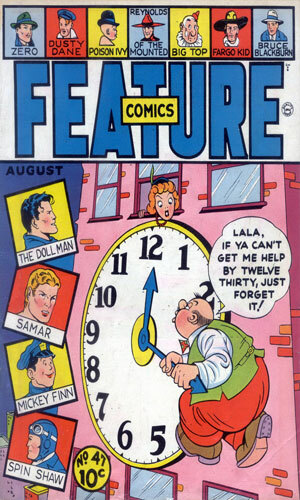 Feature Comics #49 - Sonya learns of Bruce Blackburn's apartment address and she and a cohort sneak onto the roof. When the cohort slithers down to kill Blackburn but fails, Sonya is not forgiving. Feature Comics #50 - Saboteurs are starting forest fires near military bases, destroying the facilities. Bruce Blackburn finds what he hope is a clue in the ashes, a book of matches. 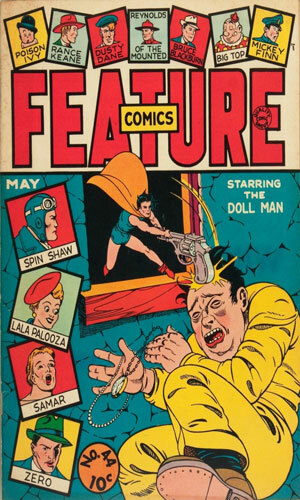 Feature Comics #51 - A sniper under the command of Sonya is waiting atop the Empire State Building to assassinate the President. Feature Comics #52 - Several convoy ships are sunk near a fog-shrouded area. The Navy asks G-2 to get involved and it calls Bruce Blackburn. Blackburn is certain when he sees Sonya at a dockside dive that she is involved. I believe this is the first mention of Sonya working for the Nazis. Feature Comics #53 - Evidence points to an upcoming invasion by the Yellow Empire in California but Bruce Blackburn is certain it will be via Alaska. He heads there to check it out and when he is proven right must find an alternative way to stop them. 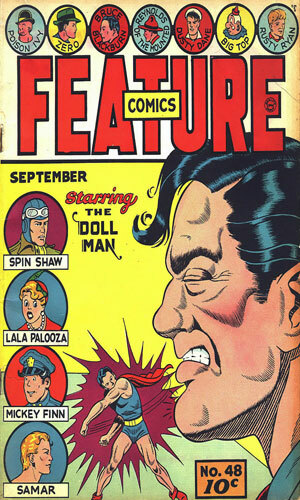 Feature Comics #54 - Someone is sending death threats to the heads of defense companies and signing it 'The Cobra'. Bruce Blackburn is on the case but is nearly killed with an arrow. Naughty Sonya is back. 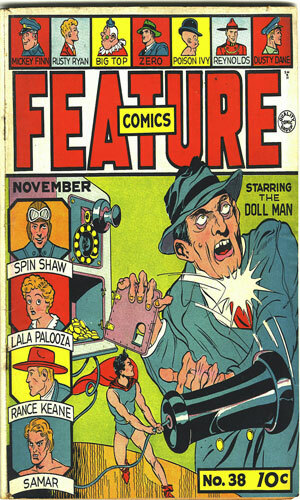 Feature Comics #55 - Secret Weapon Z is the latest device to attract enemy spies, costing a fellow agent his life. Bruce Blackburn is ordered to protect it and that means stopping Sonya from getting her hands on it. 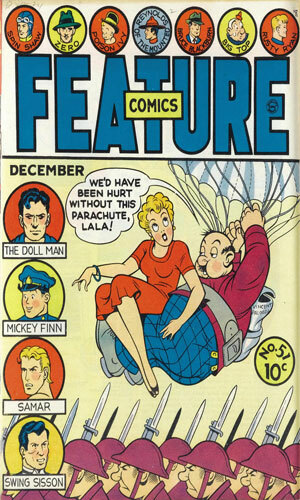 Feature Comics #56 - Again against Japanese invaders, Bruce Blackburn heads to Cuba where rumors were they were operating. He runs into a hurricane and barely survives but does come upon the enemy secret base he knew was there. I had no experience with comic writer/aritst Harry Campbell before I started reading the Bruce Blackburn adventures so I did not know what to expect. What I got was a pretty darn good action-packed mission in each issue, all told in 5 pages. That is quite impressive. Now with just a short amount of room in which to tell a full story, it is not surprising that we do not get any background on the character(s) nor is anything of their private lives ever mention (except for a tiny budding romance between Blackburn and his nemesis, Sonya that might have been more my imagination that actual). That is a pity but considering that few other spy series in comic form during that time did anything more than Campbell did with the history of Blackburn, hardly surprising. I would recommend the Blackburn stories only for their historical value as they show the mores and attitudes of that time. This is especially true in the pre-WWII adventures when the worries of upcoming conflict were growing monthly but the desire to not actually name an enemy state held firm. Of course, the Germanic accents and surnames conveyed the truth but deniability was ever there.